A ram-raider who nearly died after crashing into a piece of heavy machinery as he fled has been spared jail. Liam Anderson spotted a grey Honda CRV on Queens Road in Aberdeen with the keys still inside and stole it, with two friends also getting in. He then used the vehicle to force his way into Costcutters on Main Street, Newburgh, stealing alcohol before fleeing in the car. 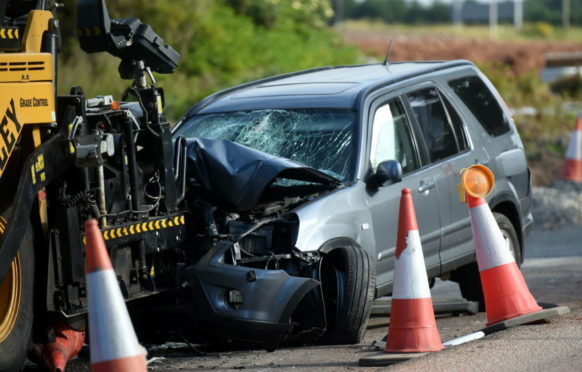 But on their way back into town, Anderson smashed into the back of a road paving vehicle parked on the Old Aberdeen Road at Balmedie. Anderson was critically injured, while his friends were also badly hurt. He previously admitted driving dangerously and harming his friends, stealing the car, breaking into a shop premises and driving without insurance and while disqualified previously, and returned to Aberdeen Sheriff Court yesterday for sentencing. The court heard the stolen car had to be written off and that the damage to Costcutters was around £7,000. Defence agent Liam McAllister urged the court not to send the 22-year-old to jail. He said Anderson had recently been diagnosed with a psychological condition and was seeking help to address it, and that he has a job waiting for him. He added: “He is the most frustrating client I have ever had. Sheriff Graeme Napier said: “You appear to appreciate the seriousness with which the court has to deal with these matters. He put Anderson on a curfew, which means he had to stay in his home on Bedford Road, Aberdeen between 8pm-6am for six months and ordered him to carry out 200 hours of unpaid work. He also put him on a three year supervision order. Anderson was also banned from driving for three years.